When entering Commercial invoices in Gateway you are prompted to allow the receipting of these invoices to be managed in Banklink. 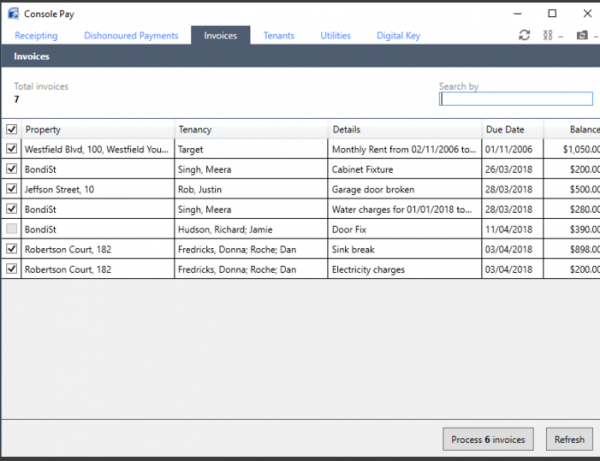 Select Include Tenant Invoices in Banklink Wizard. Once enabled, all invoices attached to Console Pay tenants created individually or via the recurring invoices wizard are available to be receipted in Banklink via Console Pay. Once enabled, enter your invoices as normal into Gateway and to appear on the Invoices Tab in Console Pay. IMPORTANT: We recommend amending your invoicing template (remittance advice) to show the preferred payment method is Direct Debit to avoid tenants making payment by another method once you have scheduled the payment. refer to Adding a remittance advice to invoices if required. Note: Banklink receipting rules apply here, so make sure there is no Paid To date entered in Gateway otherwise these funds will be allocated to rent instead of the relevant invoice.